Also, on my next show I hope to talk about the excellent Galway-Pahud interview. So have a listen to both, and send your questions and comments. If you'd like to subscribe to this blog, you'll receive instant notifications of new mp3 radio shows as well as new blog posts that appear here. Just scroll down and fill out the SUBSCRIBE box on the lower right of this page. Very cool way to keep up to date on the latest blogggggy bits and radio show episodes. Thankyou so much Alastair, Susan, Jim and Sandy (see below). All of your comments are a huge inspiration to me! It makes me want to keep trying to create this crazy little show each week. Thanks so much all of you!! put in to your wonderful site. You are an awesome person. "Fluteloops" is a terrific idea and a nice addition to your website. getting emotionally caught up in a performance. This prompted me to dig out my CD recording of Elgar's Variations. close as I'll ever get to playing in a symphony orchestra. modest embouchure slurs for intermediate players like me. I hope you will be pleased to learn that the fledgling "Fluteloops" has already sparked a creative couple of hours for one of its listeners. connection which is slower than an echidna crossing the road, but I think I'll be staying late at work on Friday night so I can hear episode two.....Great work!! I'm a high school flute player and I was browsing your site, and I saw what you said about staying away from Gemeinhardt flutes. I was just wondering, what's wrong with them? High school flautist again. I just wanted to request that you post some flute recordings on your site. I like to hear other people play so that I can get an idea of how I want to sound. You can listen to ME play on Fluteloops no. 5. 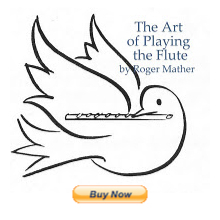 My famous flute bloopers are on Fluteloops no. 7. Gemeinhardts reportedly had "soft mechanism" according to quite a few flute technicians who write regularly on the net. They didn't hold their repairs, and the metal was too easily bent. At any time they may improve, of course; but apparently there were corners cut in the manufacturing. I went through University performance on a Gemeinhardt, in fact, but that was back in the late '70s when they were still quite sturdy. They went downhill after that for a few decades. And I wouldn't recommend the headjoints, or the slightly less-in-tune scale. I would buy an AZUMI for the same price and get a much more professional sounding flute. But if and when Gemeinhardts improve, I'll certainly be the first to recommend them. Can't say that I've seen any good ones lately.